Finding the perfect solution to a tough fabrication challenge takes a serious amount of skill, invention, and creativity. And it’s within these moments of challenge that our team gains the most. We try new things, learn new techniques, and invent new ways to deal with everyday fabrication challenges. Discover how our team utilized these tactics to develop a creative solution for a difficult part. In terms of fabrication with aluminum, the challenges are many. Here are several useful tips & techniques of welding aluminum. Whether you’re looking to buy a single part, are looking for a manufacturer for a large project, or you have a problem and need a unique solution, having an idea of the challenges of welding aluminum can help you decide how to move forward. Unlike some metals, aluminum has a rather unstable chemical composition that is easily broken up when under stress. Often, when welding the aluminum will react to the filler metal. This can cause hot cracking, breaking, and extremely brittle metal, which is likely to break in the future. In order to prevent hot cracking during aluminum welding, the welder needs to choose a filter metal that has a chemical composition with a lower sensitivity to the heat and cracking. To accomplish this, our team utilizes the American Welding Society (AWS) classification information available in a filler metal selection guide. One of the biggest challenges of welding aluminum is that it has a very low melting point. Unlike other metals that melt at a higher temperature, aluminum is more likely to warp, crack, and break during welding. In order to prevent warping, burn through, or an insufficient penetration of the weld, it’s important to use a GMAW process with pulsation capability. This kind of power source combines low background current and high peak current in a rotational capacity so the metal doesn’t get quite so hot and burn-through can be prevented. And finally, we come to the discoloration of aluminum after it’s been welded. This is caused by the magnesium oxides, or aluminum, collecting at the weld on the base material. To prevent aluminum welding discoloration, it’s important to use the right filler metal, utilize the appropriate contact-to-work distance, and hold the welding gun at the right angle. All of these can ensure that there is less buildup, and prevent the major discoloration of aluminum welding. Are you facing challenges when it comes to welding aluminum? 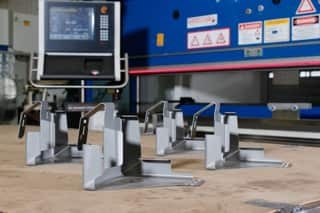 The team at All-Type Welding & Fabrication can help you find a solution to your unique fabrication challenges, contact us.